AMSTERDAM - Geoffrey van Cromvoirt, in an interview with SBS 6 Actienieuws of Holland, said that he doesn’t have anything to do with the disappearance of Natalee Holloway. He could have seemed to be another person in the case. Ironically, van Cromvoirt had wanted to participate in the reenactment of the case along with his sister. “I’ve always wanted to appear on television, but not in this way”. The Dutch youth was asked via telephone to go to the police station one week after ‘Opsporing Verzocht’ aired. According to van Cromvoirt, police officers put him under a lot of pressure when he was detained. This, according to the Dutch youth, who continued to say that they were afraid that he would hang himself. He said that he would never do this, and that he slept in his underwear for two long days on a cement bed. ORANJESTAD (AAN) – The investigation on the case of Natalee continues and from one day to the other, more information continues to come out, which has caused a few people to walk around with a lot of nervousness. No matter how long it lasts or how many people believe that they will be able to cover things up forever in the case of Natalee, the truth will come out and as DIARIO has already published: few words are necessary for those who are good listeners. 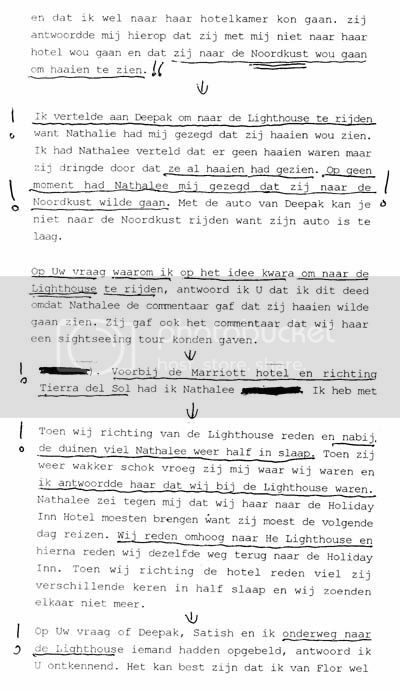 During all the interrogations in the case of Natalee conducted by local authorities and also those from Holland, the matter of the Lighthouse and the ridiculous matter of going to going to see sharks at the lighthouse shows very clearly that there was and still is formal and systematic lying in regards to whether the three principal suspects went to the lighthouse with Natalee or not. At first, Joran van der Sloot himself declared that they went to the lighthouse and that he, himself, told the Kalpoe brothers to go in the direction of the lighthouse while Joran ‘supposedly’ was sitting in the backseat of the car with Natalee. During other interrogations which continued, Joran van der Sloot himself radically changed his declaration in what concerns the matter of the lighthouse and it could even be observed that the way that Joran got to hear that the Kalpoe brothers did indeed declare and were firm on the matter of going to the lighthouse, Joran became like an angry bear. Today DIARIO has reproduced a part of the controversial declarations that Joran first made on the matter of the lighthouse, which he accuses the Kalpoe brothers of lying about going there and today, everyone can read how Joran was changing his version every time. In one declaration alone, he contradicted himself even on the matter of going to Noordkant [northern tip] with Natalee. At first, Joran declared that Natalee herself asked to go to the North side of the island to see sharks (a very ridiculous proposition in the darkness of night; neither day nor night can one see sharks on the Aruban shores). In the sequence of declarations as to whether the lighthouse or not, today the readers themselves can read how one behind the other, Joran himself declared that they went to the lighthouse, to later during other interrogations (which also will be published) he categorically denied the matter of going to the lighthouse and it is because of this point here that the investigation smells badly.